Many Operational Excellence implementations fail after a few years. What’s the common denominator in S&OP, Logistics Collaboration, and Operational Excellence failure? Why do many S&OP’s fail or are companies not satisfied with them? Why do most attempts to collaborate in logistics services fail? 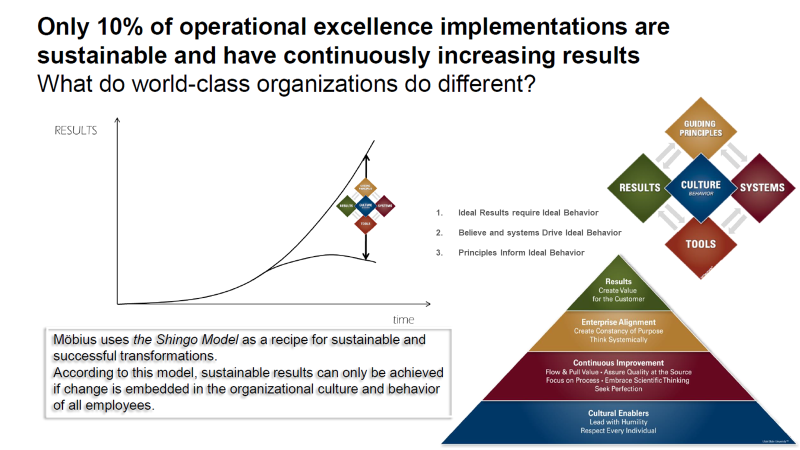 Why do many Operational Excellence implementations fail or cease to exist after a few years? During the last 15 years, holding several Supply Chain Management and Operational Excellence management positions in the chemical and pharmaceutical industry, I got intrigued by these questions. With full motivation, enthusiasm and inspiration, we start these type of excellence implementations. We collect a team of colleagues who are as motivated as ourselves and off we go. With such a team you accomplish a lot. Failing is not an option… failing is not even a thought! You design the processes, a meeting structure, some useful tooling, a (KPI) dashboard to monitor progress and success of course. You nominate people on new jobs, and the spirit gets higher and higher. After some time, the first hiccups appear. Results are not progressing anymore or decrease, enthusiasm is fading, people stop attending the meetings we agreed to be important, some people leave the process or the company, executive management is asking what’s going on… And our first reaction (often being technicians, engineers)? Redesign of the processes, new tooling (“look what great graphs they can make…”), try harder, motivate new people again. And guess what? We are able to resolve problems, results go up again…we did the right thing! Or didn’t we? Because the next hiccups are visible… and quicker than last time. We just did some repair, “sticking plasters”, but obviously we have not been able to get to the real causes of failure! Recognizable? And what’s the common denominator in S&OP, Logistics Collaboration, and Operational Excellence failure? In the past one and a half year, I was introduced to the Shingo Model… and I got intrigued… again… but this time it felt totally different. Of course – this was the key background towards failure! We, technicians and engineers, start with implementing tools, design processes and we trust these will be so great that they will run on their own. But don’t we forget something? Right! Ourselves, our colleagues, the team, our bosses: the human, our behaviors, our culture. Of course, you would say, but why do we often forget to pay the right attention to this? The basis of the Shingo Model is that culture is in the heart of excellence. That’s where sustained success starts; process and tools will follow. You can only receive excellent results when you have excellent culture. Sounds good, I hear you saying, but “culture”, isn’t that something intangible, difficult to touch, difficult to change as it’s there “already for ages”? If you consider culture as the sum of all behaviors, it all becomes easier. A behavior ís something tangible: it is everything you can see a person doing or hear a person saying. So, behavior is observable, and hence it can be managed! An option is to translate KPI’s into KBI’s. KBI’s, what’s that? KBI’s are Key Behavior Indicators. Where Key Performance Indicators, usually are lagging indicators (you notice performance after appearance), Key Behavior Indicators are leading indicators: if you monitor real behavior versus “ideal behavior”, you can steer people towards the right behavior towards excellence… pro-actively and upfront! The main issues in S&OP’s are caused by lack of (executive) management commitment, and by silo thinking. Sales keeps on saying how difficult it is to forecast…” our market is really different”, and Manufacturing does not want Supply Chain Management to control what they do. It all leads to insufficient alignment through the organization, back-off in showing commitment to the process, and eventually an S&OP process with poor results and dissatisfaction. Defining desired, ideal behavior, needed from the members and their teams, could be a key to a successful S&OP. Defining the observable behaviors that create or destroy trust, will pay off (Franklin Covey wrote a great article about this: “How do you measure trust?”, in speedoftrust.com). S&OP examples are attending the meetings in a proactive manner, number of decisions made (countering the often seen “informational S&OP’s”), Sales visiting the plant and Manufacturing visiting customers to build understanding for each other’s circumstances. You will notice that mutual trust will grow and with it the performance of the S&OP. Many SCM VP’s, consider Logistic Collaboration as the future for improving costs, efficiency, and transparency in the distribution. Why is there still more talking, than actual success and practicing? Again: behavior! In case you really want to cooperate, you seek for alignment between partners in the value chain, you communicate, you look for each other’s needs and barriers. Can you share your strategies to give insight? You gradually build trust, the relationship gets more intense, and off you go. Also, a solution towards success could lie in cooperating on defining ideal behaviors from and towards each other. I have very positive results on improving customer-supplier relationships with this methodology, where reliability of supply improved, because the transparency between client (“what exactly do I need”) and supplier (“what can we really do, and do we dare to say no when client ask the impossible”) became large and trust was high. Got intrigued as well? Let’s connect and discuss!